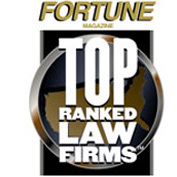 Brinker & Doyen, L.L.P., has once again been selected as one of the top ranked law firms in the country to be published in the December 24, 2012 issue of Fortune. Of the more than 250,000 law firms in the U.S. rated by Martindale-Hubbell, the legal peer-rating service, less than 2,500 firms were selected. Attorneys are graded by Martindale-Hubbell on their professional ability and ethical standards based on the confidential feedback obtained by Martindale-Hubbell from other lawyers and judges. “It’s very flattering to be recognized nationally for what our clients know firsthand,” said Brinker & Doyen Managing Partner Gary Paul.